Thai Prime Minister Prayut Chan-o-cha and Philippine President Rodrigo Duterte in a 2017 summit meeting. The engagement spotlighted the ongoing development of the security realm of the relationship. On March 29, two Thai navy vessels were in the Philippines for a goodwill visit. The development spotlighted the ongoing activity within the defense realm of the relationship between the two Southeast Asian states amid wider domestic and foreign policy developments. As I have noted before in these pages, Thailand and the Philippines, both U.S. treaty allies in Southeast Asia, have long shared defense ties as part of their wider bilateral relationship. Defense ties include exchanges, visits, and exercises, and the range of functional areas for collaboration extends to various areas such as tackling counterterrorism, maritime security, humanitarian assistance and disaster relief, and other transnational crimes such as smuggling and trafficking. Both sides have been attempting to further boost joint collaboration in recent years, with incidents in both countries, such as the Marawi Crisis in the Philippines, and the incremental development of regional security mechanisms in ASEAN-led fora, being just a few examples of sources for that cooperation. In addition to discrete engagements, the two sides have also looked to further develop the architecture of the defense relationship, with a case in point being the official setting up of the Joint Committee on Military Cooperation – which effectively completed a series of arrangements signed between the two countries’ major services beginning with the navies in 2012, the armies in 2015, and the air forces in 2016. This week, in another example of this, two Royal Thai Navy frigates paid a visit to the Philippines. The two frigates, the HTMS Naresuan (FFG-421) and HTMS Bangpakong (FFG-456), docked at Pier 15, Manila South Harbor for a scheduled goodwill visit, which the Philippine Navy characterized as the fourth visit of Thai ships to the Philippines since 2010. 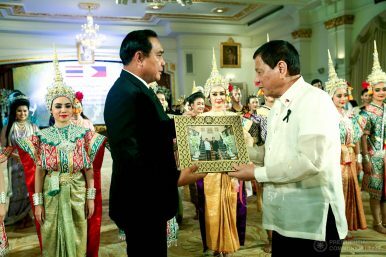 The goodwill visit, which kicked off on March 29 and will last through April 2 — as the dust continues to settle in Thailand’s 2019 elections — included a series of engagements. To kick it off, the ships, headed by deputy commander of the Royal Thai Naval Academy, Rear Admiral Chanint Phadungkiat, and accompanied by the RTN Cadet Cruise Training Unit of more than 500 naval cadets, were met with the BRP Ramon Alcaraz (PS-16) off Corregidor Island and escorted to berthing, where they were welcomed by Philippine personnel. A series of other activities will occur during the visit of the ships, including meetings between personnel on both sides, a shipboard tour, receptions, and friendly games. Before the sendoff ceremony for the vessels tied to their departure, the Philippines will also conduct a passing exercise (PASSEX) with the departing vessels as well.